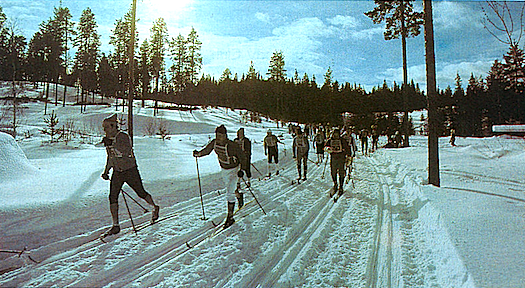 In developing the adidas Norm 38 system we went to the experts: cross-country skiers Together we produced a unique system for everyone from beginners to competitive skiers. At just 8 ounces* adidas’ lightest cross-country shoe the Suomi offers excellent comfort and flexibility. The extended sole ensures maximum push, and the unique heel wedge optimizes ski control and adds to stability on descents.  The built-in insole is comfortable and retains warmth. The “Racing 1” binding’s super narrow construction allows smooth gliding and prevents lateral release. 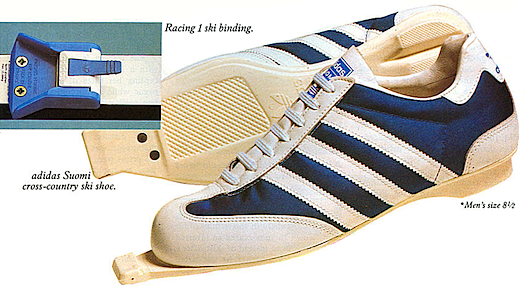 The adidas Norm 38 is the scientific system worn by 24 medal winners at the 1978 Nordic Ski World Championships in Lahti, Finland. Now it’s ready for you. 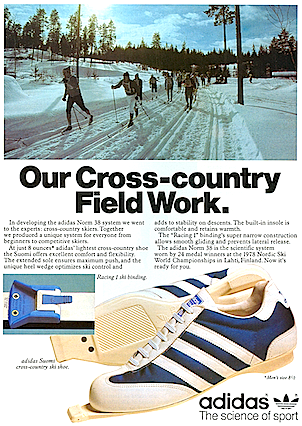 adidas Suomi cross-country ski shoe.